A nationwide search for some sought after fabric with no avail, led to the purchase of this Kaffe Fassett fabric (Big Bloom in Pink) from Rosebud Quilter on Etsy. Michelle from Rosebud Quilting also sent along a whole bunch of 1 1/2 inch squares which she thought I might like playing with. Rightly so, it inspired some fun fabric play, free motion quilting practice,and my next quilt? Just one inch squares. Maybe? I love the idea of a quilt with tiny squares, and I am working out a plan for a more efficient strip piecing method. Love what you did with the squares! Great practice for something possibly bigger. How lovely to receive a little extra fabric to 'play with'. A whole quilt on 1 inch squares will be fab!! Keep us in the loop. If that link doesn't work, it was called "Elizabeth's Fabric Focus ~ Quick-Piece Tiny Squares"
All of your work is beautiful. Thanks for the inspiration. Gulp. Those squares are teeeensy. And beautiful. King size, you were thinking, right? love the little squares - i would like to do something with 1 inch squares sometime. your quilting looks GREAT!!! I love that style of quilting, it makes quilts look so much more modern to me. I'm looking forward to trying it out on one of my quilts. One inch squares??? That will be a fabulous quilt -- I love little pieces. Can't wait to see it! I love the tiny squares! I, too, have tried the technique shown at Sew, Mama, Sew, but I will be watching this space to see if you come up with something that doesn't end up as stiff! That was so nice of her...what fun! I love the one inch squares and the quilting. It looks great! Those one inch squares are too cool!!! Love them. I like them with the white fabric. Did you piece those or sew them on top of the white fabric? Your quilting is great on those pieces. I, too, will be interested to see what you come up with on your efficient strip piecing method. I'm thinking I might do something similar with those two inch Moda Sampler packs I purchased. Thanks for sharing. I just love what you have done with them so far! Fabulous! Practice quilting...on my list of to dos! That is just so gorgeous! I love little squares too - so much possibility! Are the little print squares just sewn down with the stitches or pieced? I like the look. Finished my quilt on the train this weekend. Thanks for the tips, It looks great! 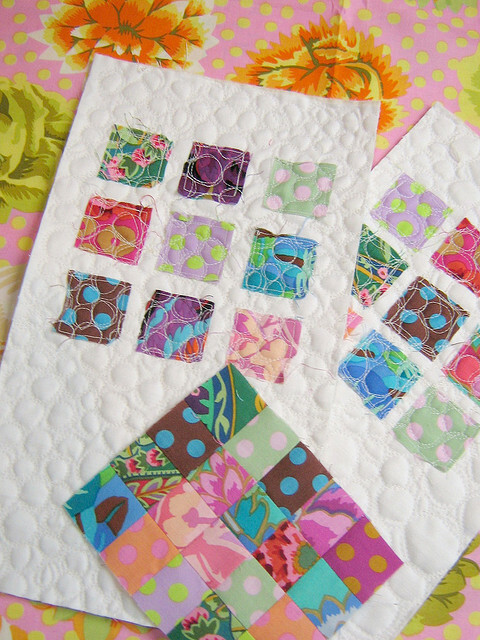 Ooooh, love that fabric and you 1" square quilt hmmmm sounds like a wonderful idea!!! I love your free motion with the tiny squares. Just gorgeous. wow, love what you did with the tiny squares, looks like the voting is in...all want to see an inchie quilt from you, me inlcuded. I dream of having time to do one some day, I've seen a couple at our local quilt shows that have been absolutely incredible. Your pebble quilting looks fantastic. Can't wait to see what you do with the Big Bloom. Thanks so much for shopping with me.